Pat had a hard time parting with Blossom, who was not actually for sale. But when I walked in the door, Blossom was the first dog to welcome me, and she followed me around the house. Pat saw the instant connection and decided to offer Blossom to me. I was quick to accept this beauty. She was everything I was looking to add to my breeding program in terms of appearance, personality, pedigree and health. 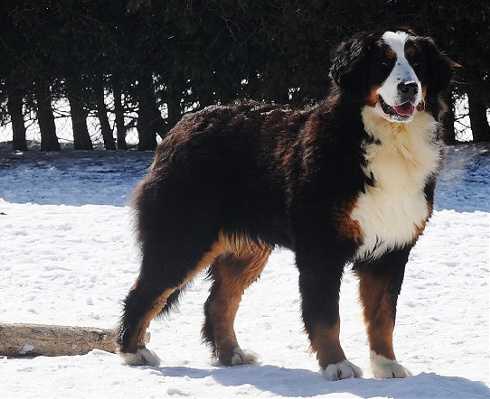 I consider Blossom to be the perfect Bernese. She would fit well into any family and has been a breeze to raise. Gentle, loving and easygoing, there isn’t a hyper bone in this dog’s body. She’s very welcoming to everyone that comes to the house, and is fine to be left on her own. She is also great with the other dogs. One of my larger girls, she is still very gentle with the smaller dogs. Blossom is also a SwissRidge canine hero. Not long ago, one of my Bernedoodles, Maggie, consumed an unidentifiable object that caused an intestinal blockage. After the surgery to remove it, Maggie didn’t bounce back as she should have, and needed a plasma donor. I chose Blossom, of all my dogs. This is partly because Blossom is an incredibly calm dog and I knew she’d cope with the long process gracefully. But I also had a secret—and completely unscientific—hope that a bit of Bossom’s gentle nature might get transfused into Maggie as well! Maggie is a great dog, but she is far livelier than Blossom. The treatment was a success, but Maggie is still Maggie; she’s tried to eat another foreign object already! So, while Blossom couldn’t pass along her placid nature, she did save a life through blood donation, and it’s just another reason I am so lucky to have this girl part of my breeding program. Blossom’s parents were both thoroughly health-checked by Pat, and have hips in the 90th percentile on the PennHIP score.